I posting this here, more because "Part 2" relates to FF book Eye of the Dragon, but mainly because these images were printed around the same time of Russ Nicholson's art in Warlock of Firetop Mountain. 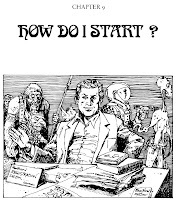 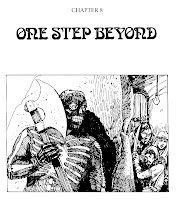 There's a celebration going on here and thereabouts, because it's 30 years since the first of the Fighting Fantasy Gamebooks were published. 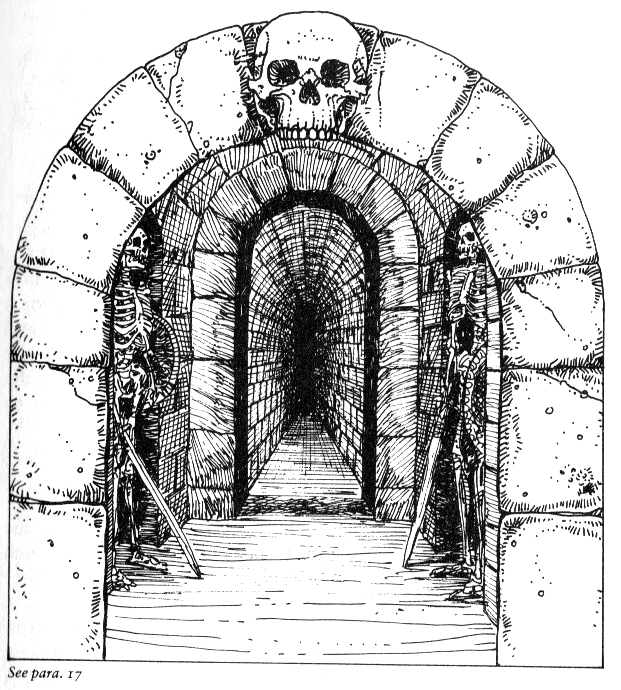 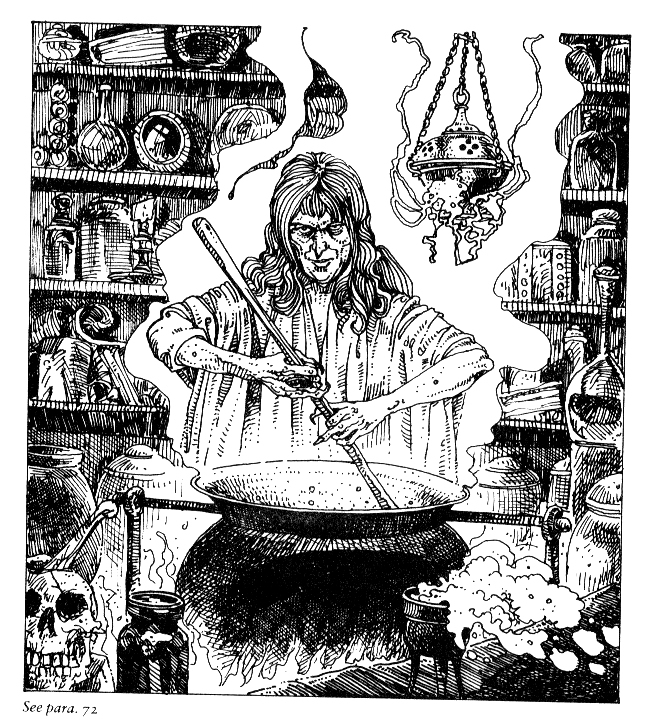 The interior art of that first book, The Warlock of Firetop Mountain, was by Russ Nicholson, whose inked line art also graced the pages of Fiend Folio, The Fabled Lands and many other fundamental UK RPG-related titles in the 1980's. 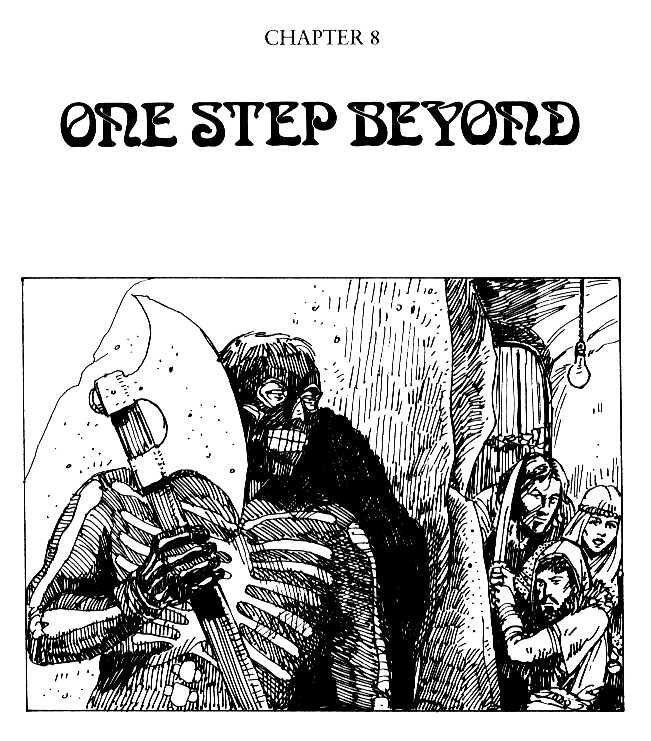 A gritty savage beauty burst from the pages of Firetop Mountain and Citadel of Chaos. 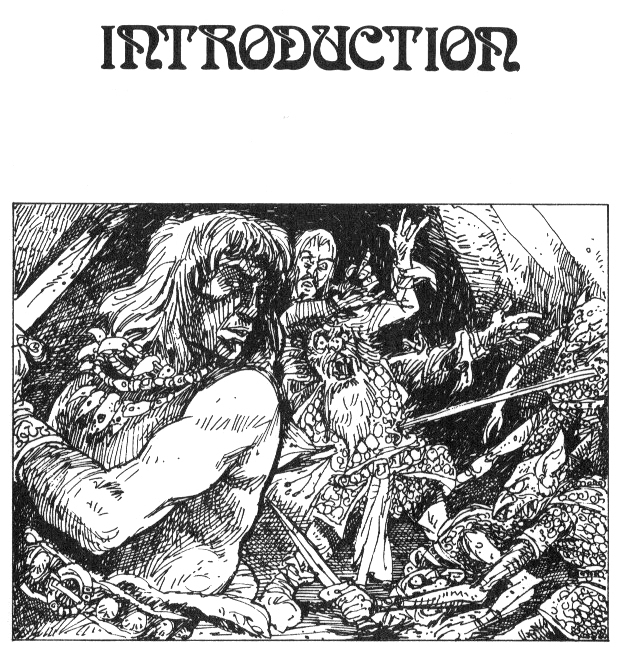 It was refreshingly different from the Heavy Metal magazine -Conan and Gor influenced- clichéd covers of the time. 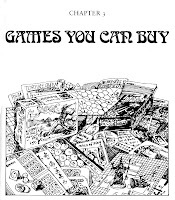 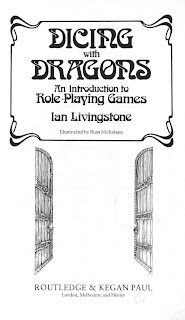 Considerably rarer than the many reprints of those early gamebooks is the rather infamous Dicing with Dragons - An Introduction to Role-Playing Games, authored by Ian Livingstone (1982, Routledge & Kegan Paul). 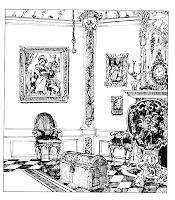 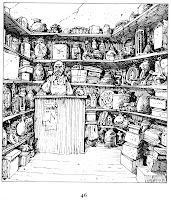 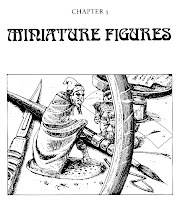 I find Mr Nicholson's freehand illustrations in Dicing With Dragons, with all of their details, especially inspiring when thinking about the hobby. 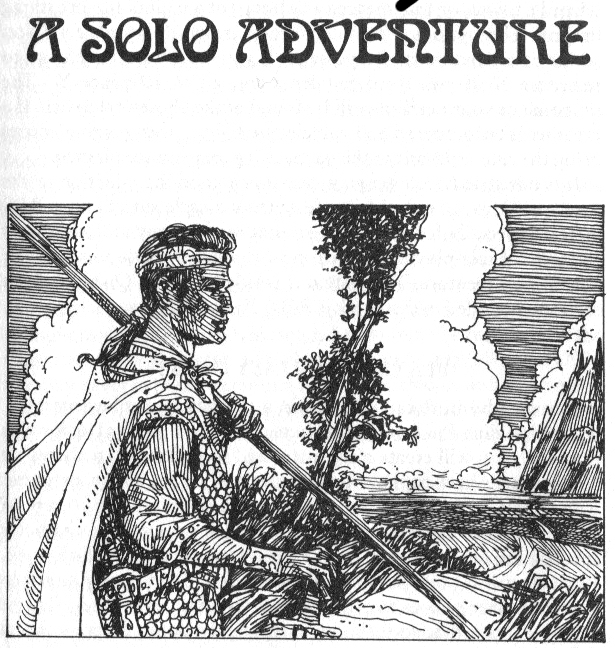 What is interesting in the frontispiece is that we see an armed traveller, a wayfarer -an "adventurer"(!) 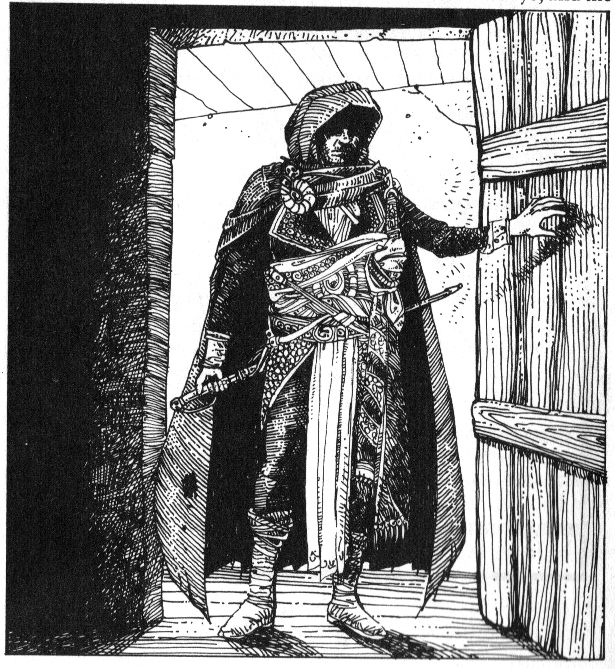 even - with a quarterstaff and patchwork leather armour - possibly similar to the invisible hero of the Fighting Fantasy gamebooks (those which were set in the fantasy genre). 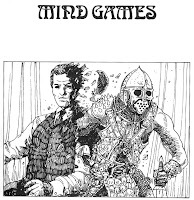 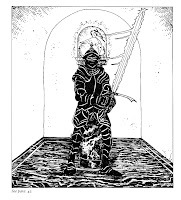 Generally, in the early Fighting Fantasy gamebooks, the hero, who lives by their wits, is leather armour-clad and is commonly on foot - about as far from the heroic knight in shining armour on horseback, or the half-naked helmeted barbarian, as you can get. 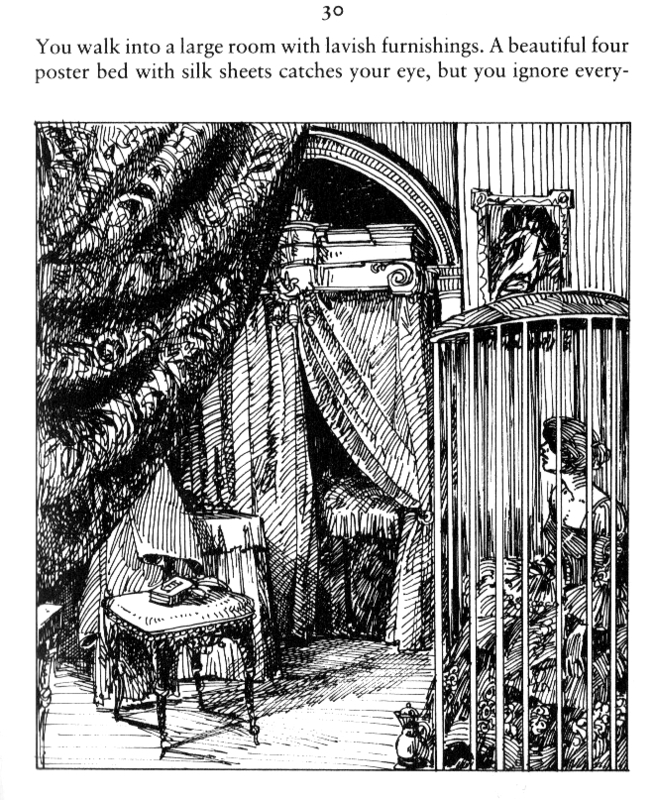 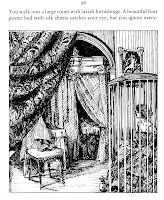 Since "YOU" (yes, you, in capitals) "...are the hero", I understand that most of the scenes in those books are depicted from the "point of the view" of the reader, so that you rarely see how your fantasy persona is dressed. 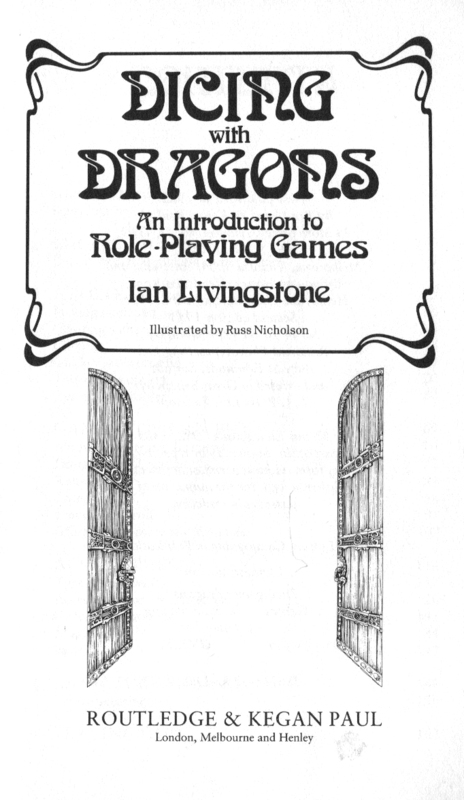 Ian Livingstone's introductory solo adventure in Dicing With Dragons is thematically and dice-mechanically very close to the Fighting Fantasy books. This solo adventure was recently rewritten and published as a new FF title in it's own right, Eye of the Dragon. 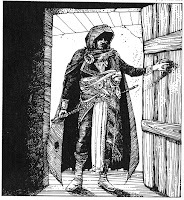 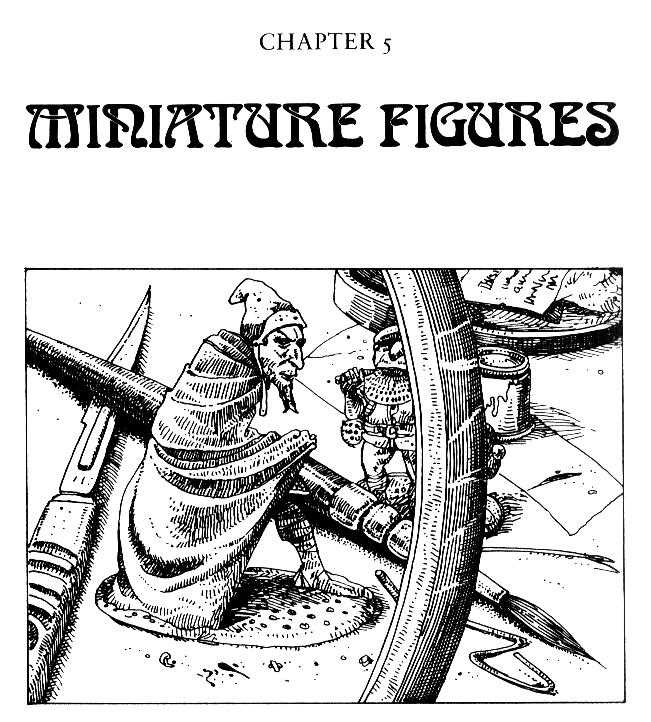 So naturally, I assumed long ago that this lone figure (and the one depicted in the chapter header of the Solo Adventure) is pretty much as close as I could get to what a Fighting Fantasy hero, with his customised trappings, might look like. 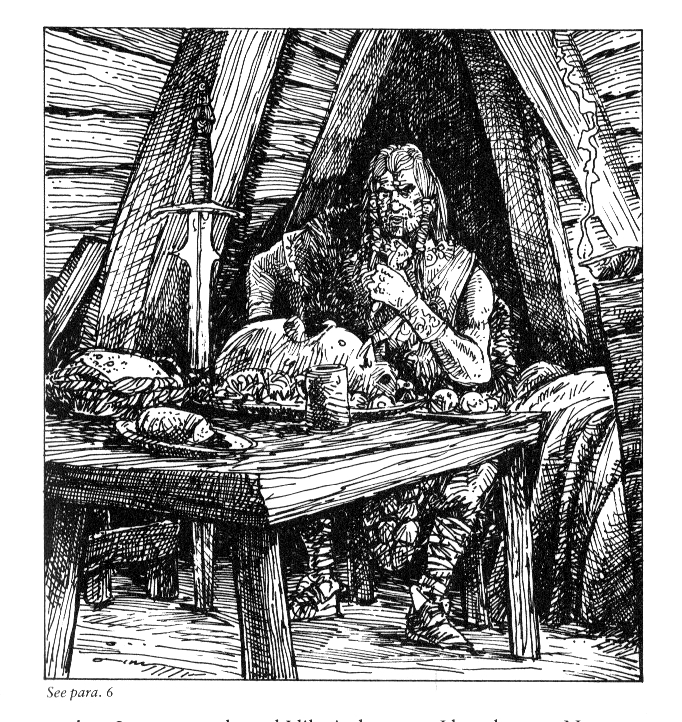 In this post is art from the chapter headers for Dicing With Dragons - in Part Two - I will be including illustrations from the solo adventure. 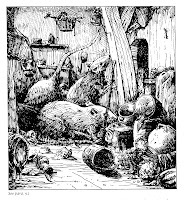 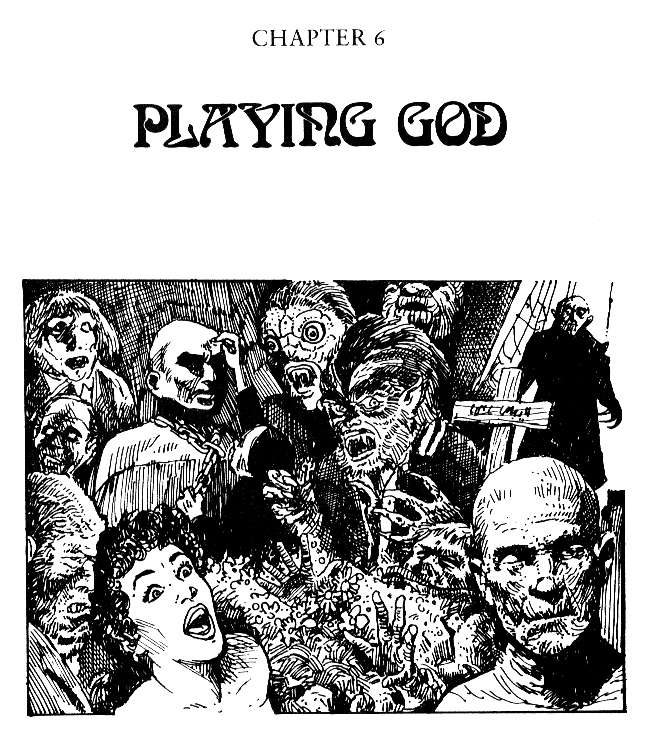 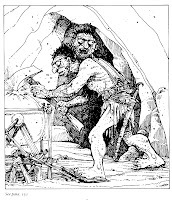 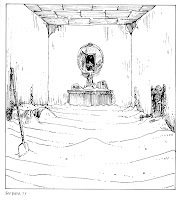 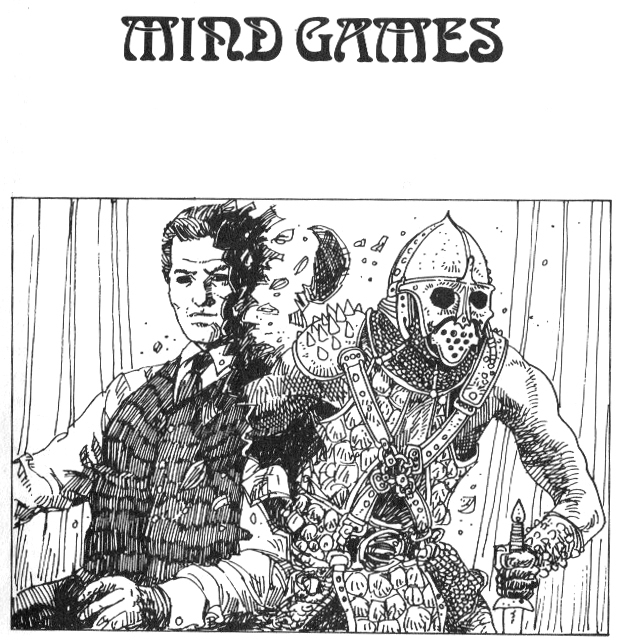 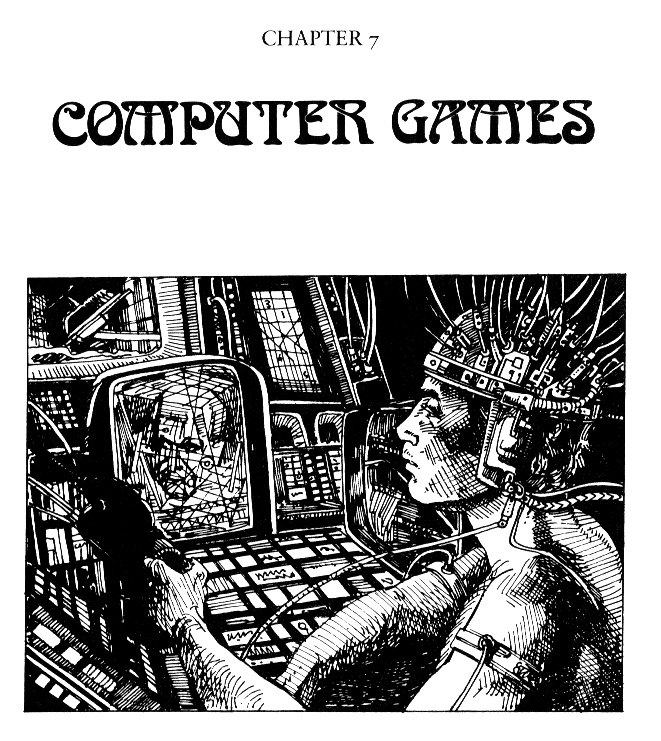 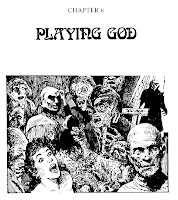 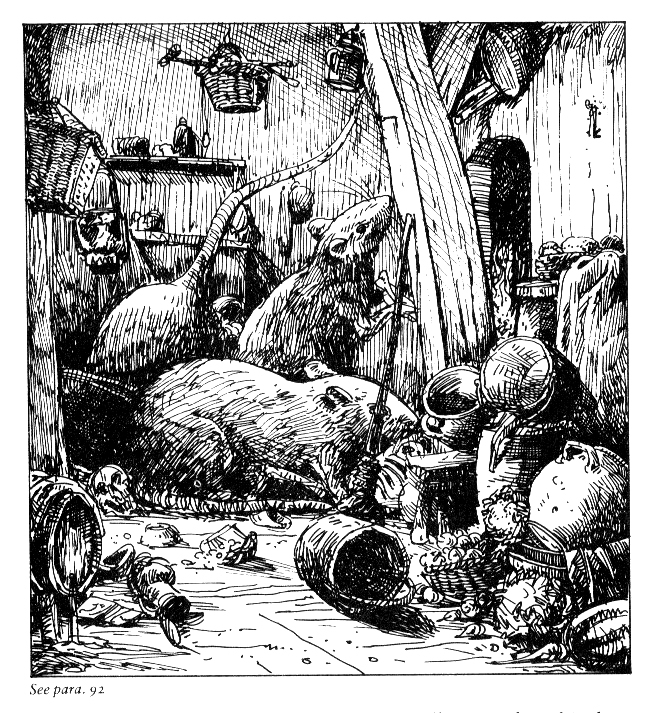 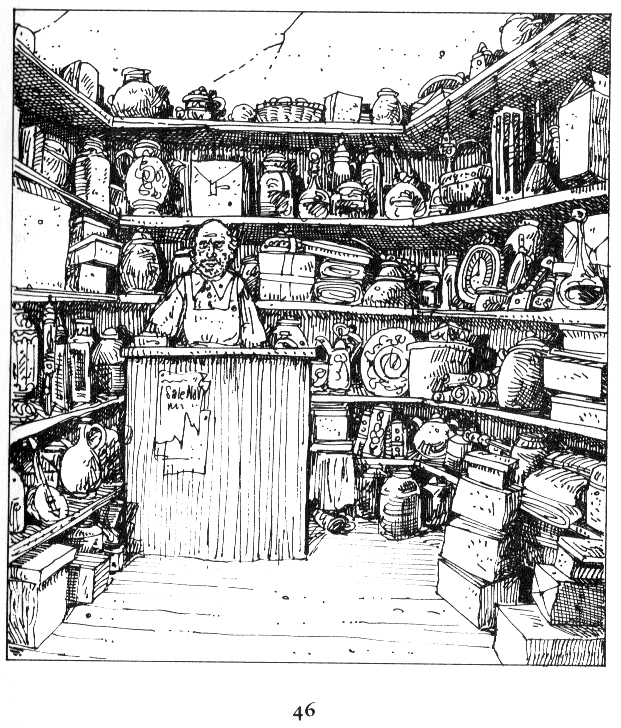 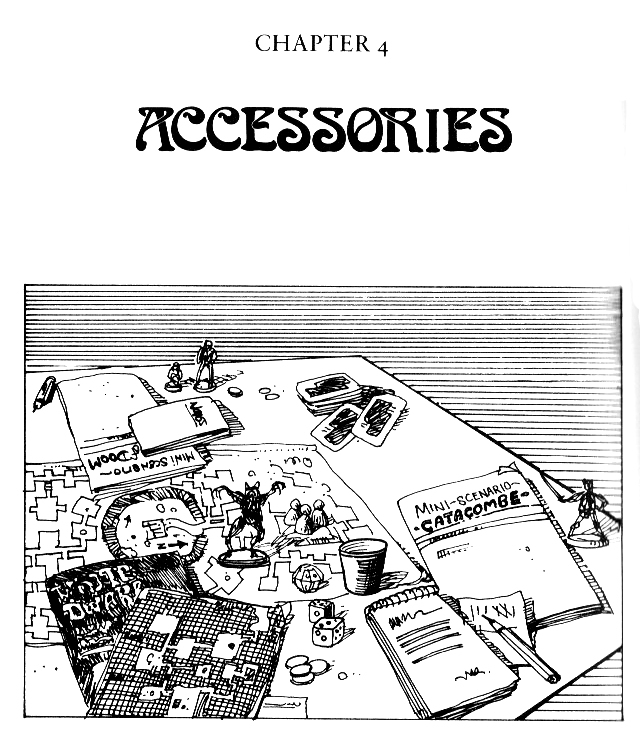 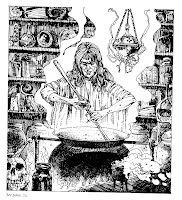 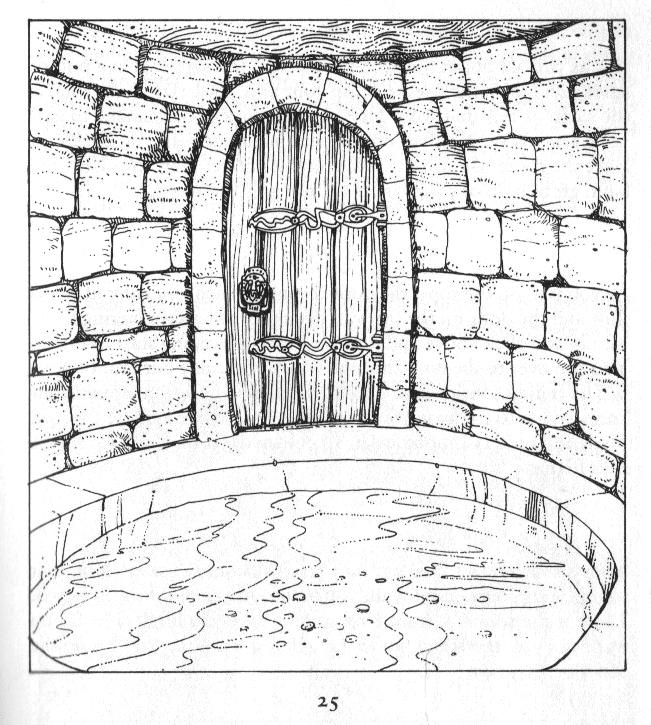 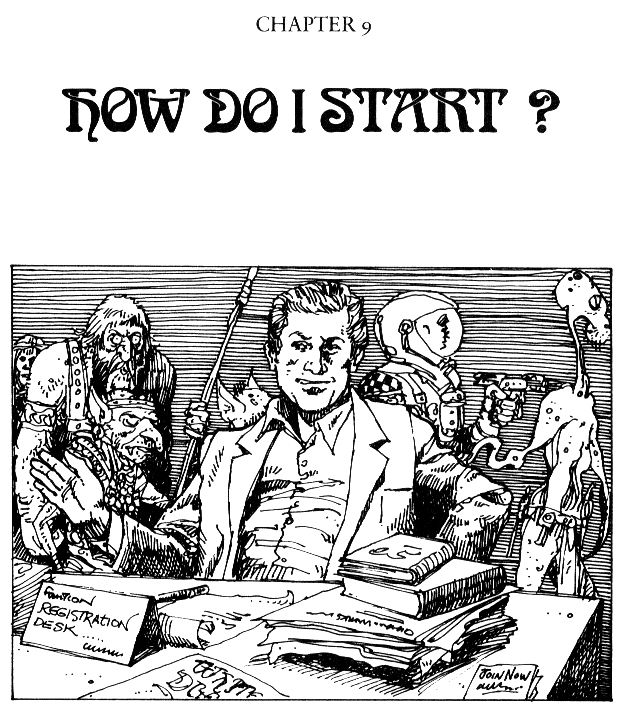 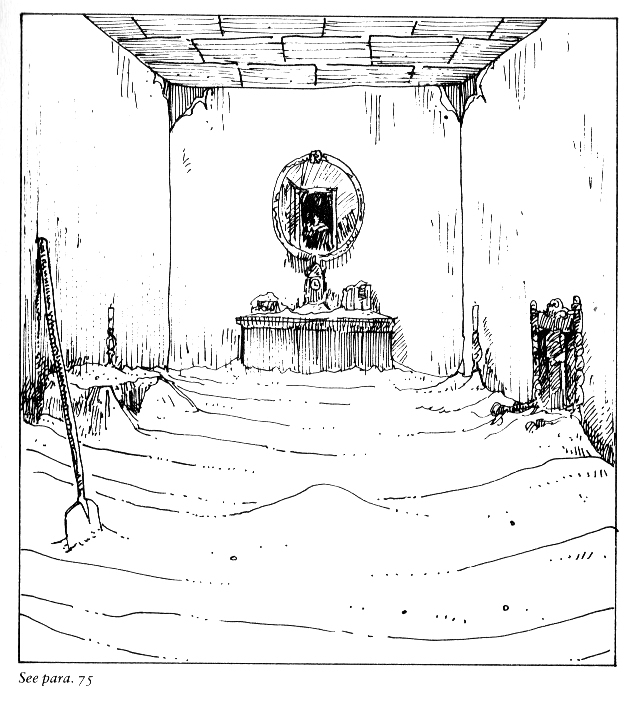 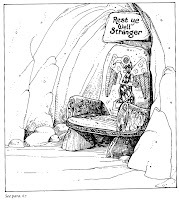 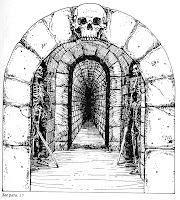 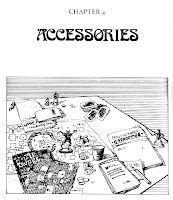 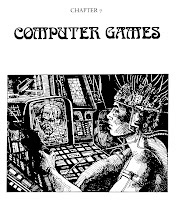 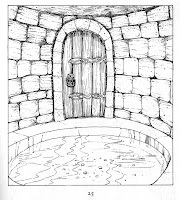 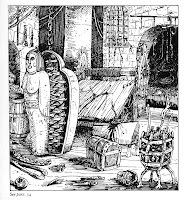 As mentioned in the previous post and others, Russ Nichsolson art style had formative effects upon my perception of fantasy worlds and gaming in general, notably his illustrations in Warlock of Firetop Mountain and Citadel of Chaos, which is apt to mention because it's 30 years since those interactive gamebooks first raised the standard of solo dungeoneering. 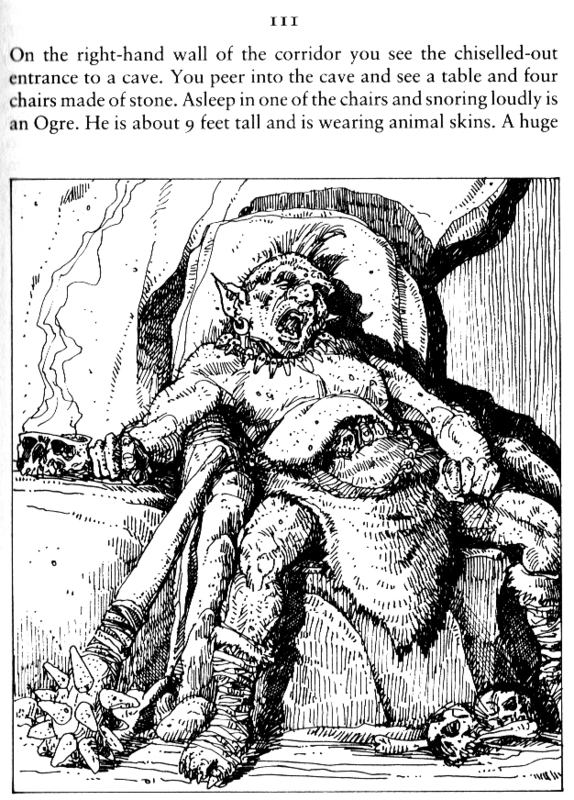 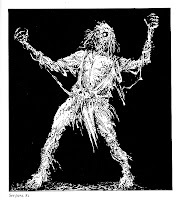 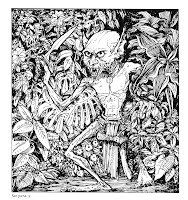 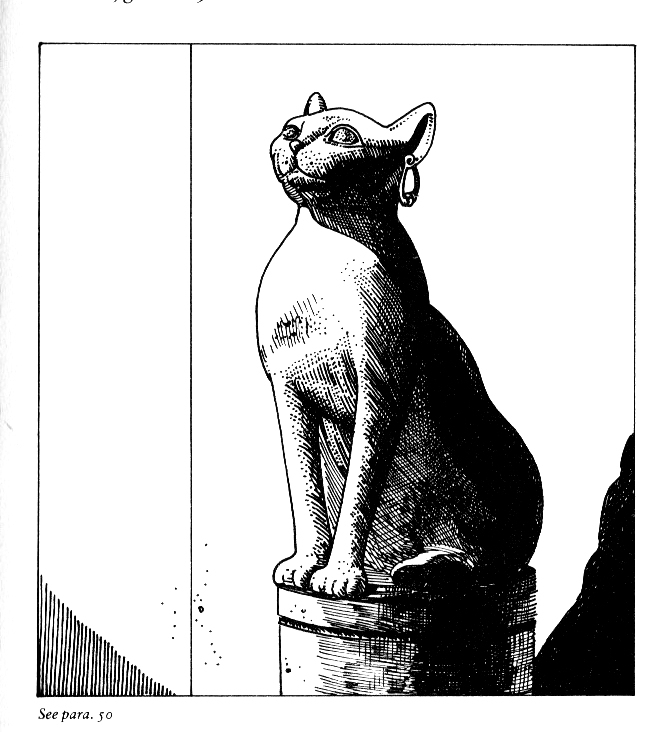 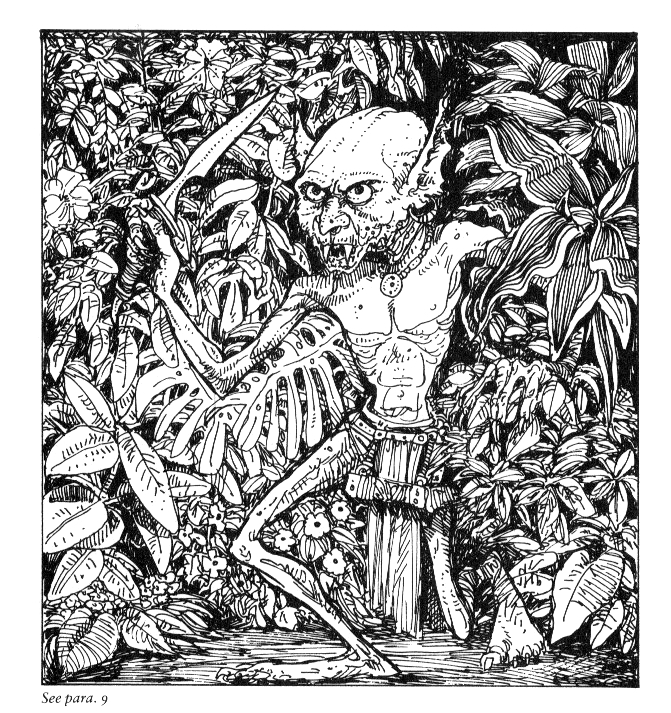 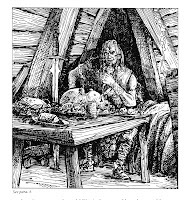 AD&D fans will know him better from Fiend Folio -in which his black and white ink work truly shines. 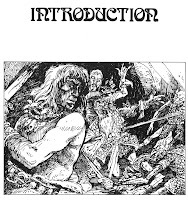 Gamebook fans have also been treated to his work yet again in the re-released of the Fabled Lands books, which like, a handful of Fighting Fantasy titles are available to play on the iPhone and iPad (Fighting Fantasy is also sold in Kindle formats). 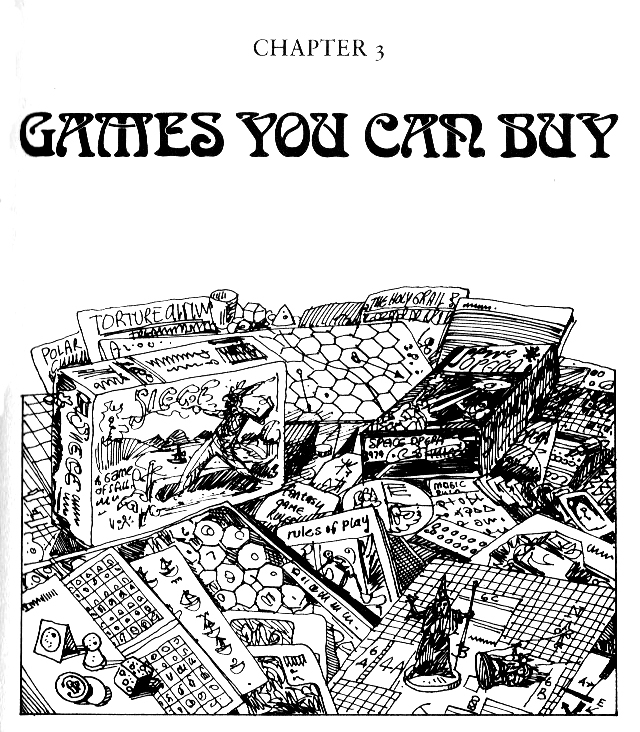 Incidentally, I still have some particularly early Puffin copies of Warlock of Firetop mountain here. 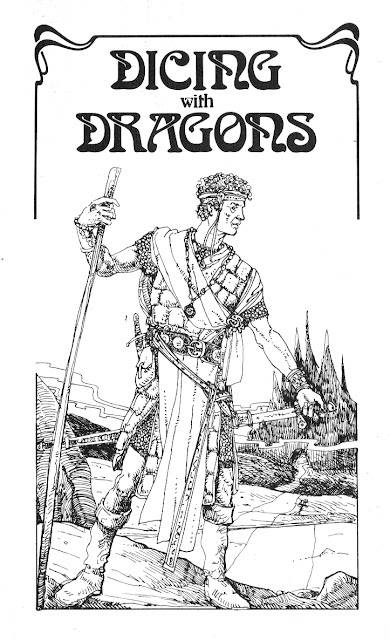 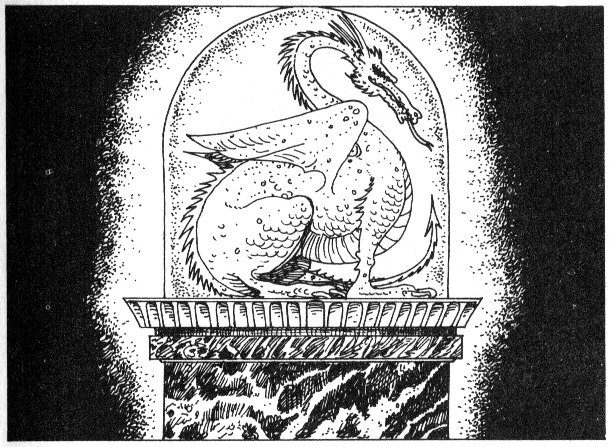 One of the original reasons for wanting to post my scans of Russ Nicholson most fabulous drawings from Dicing With Dragons (by Ian Livingstone, 1982) was to share with the current generation of Fighting Fantasy readers images from what was the forerunner to Livingstone's Eye of the Dragon , published in 2005. 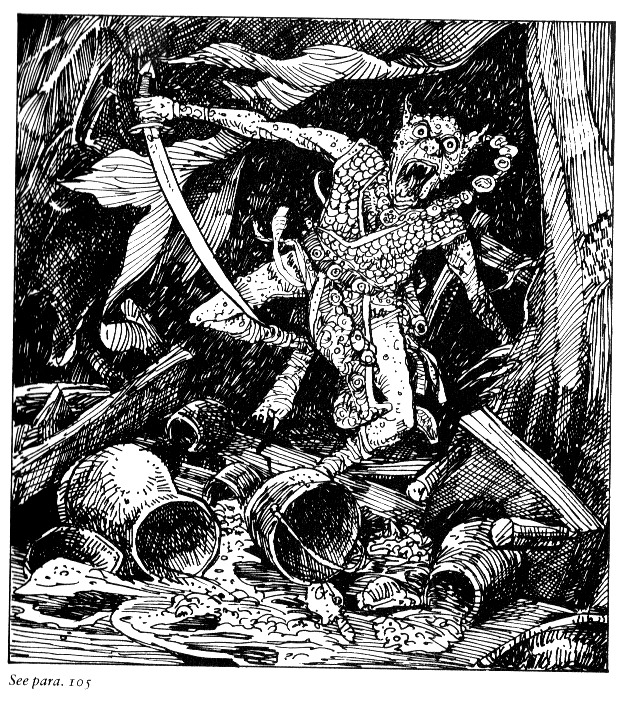 Since many of the younger readers of Eye of the Dragon may never have seen a copy of Dicing with Dragons, I felt that this would be a good opportunity to share some of the similar scenes taken from a different artistic perspective to the stylishly realistic dark sketches of Martin McKenna. 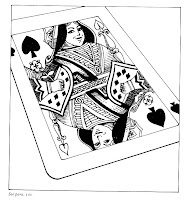 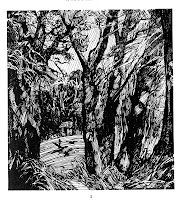 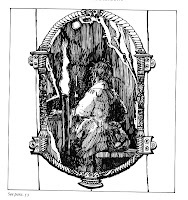 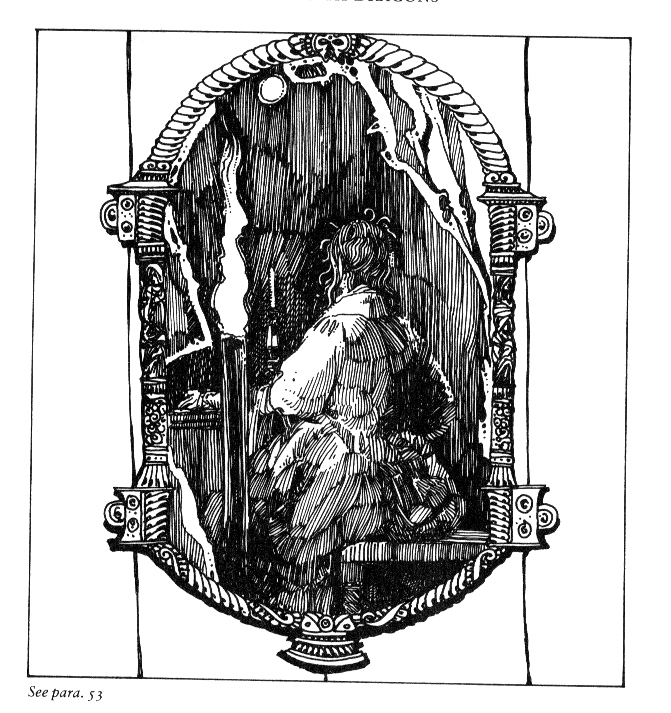 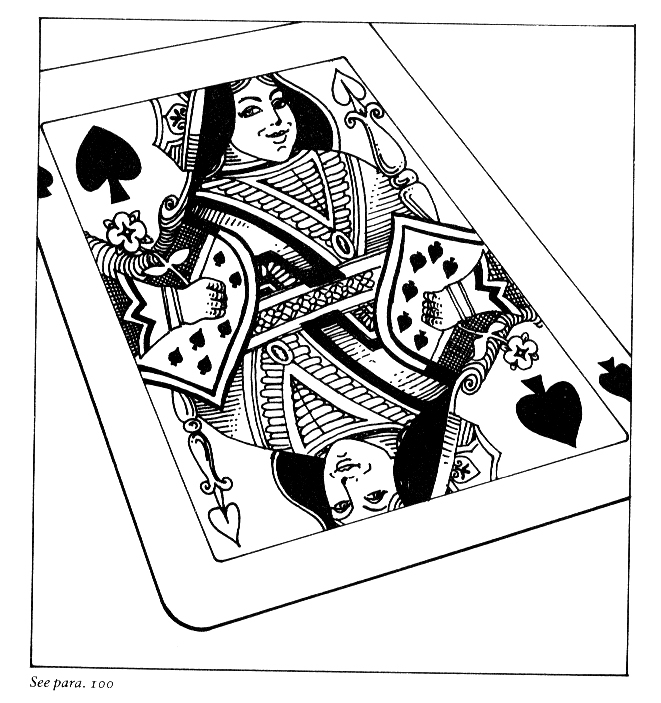 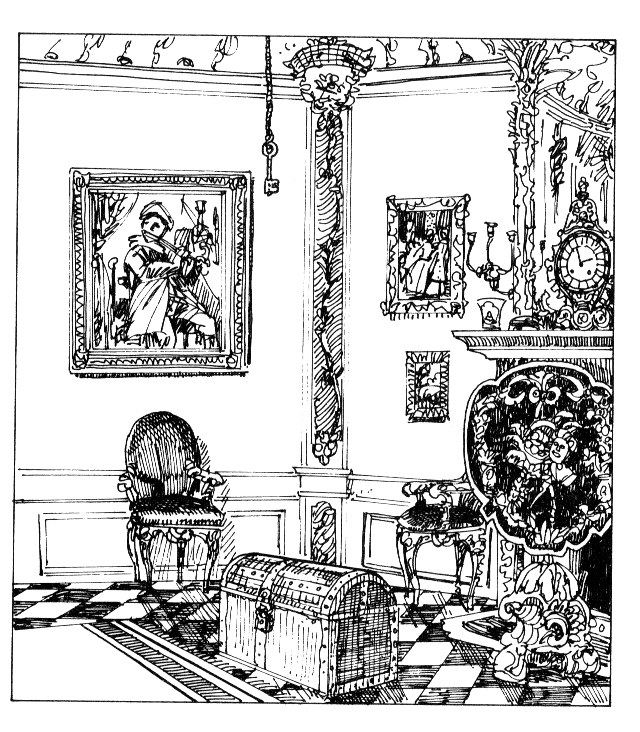 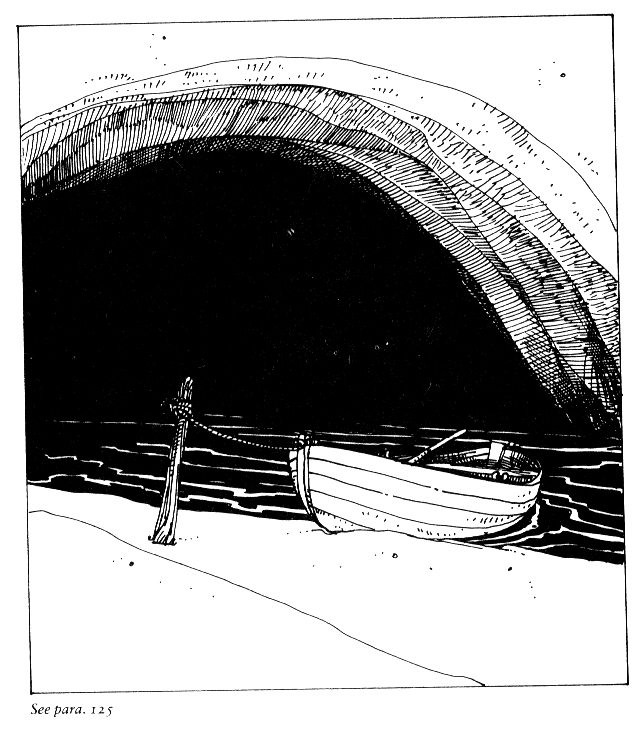 Nicholson reminds me of Grimm's fairy tales grown-up, as if drawn by Beardsley with a touch of Rackham with a peppering of the Pre-Raphaelite. 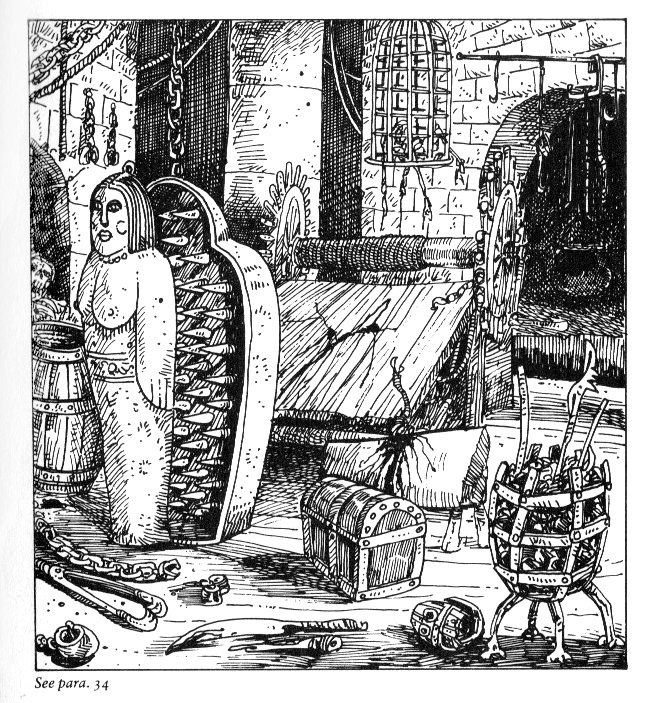 Wood grain and gem work abound, enemies dressed in swathes of cloth suggest the exotic and alien. 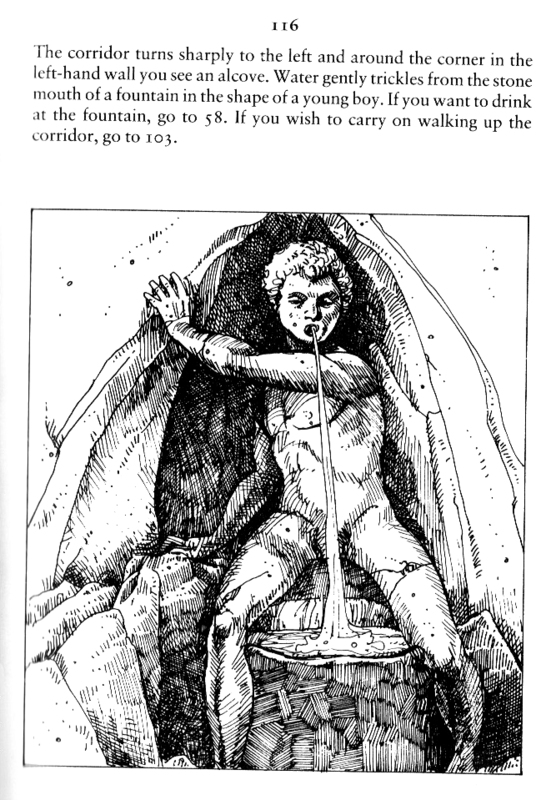 The caves feel dirty and dusty. 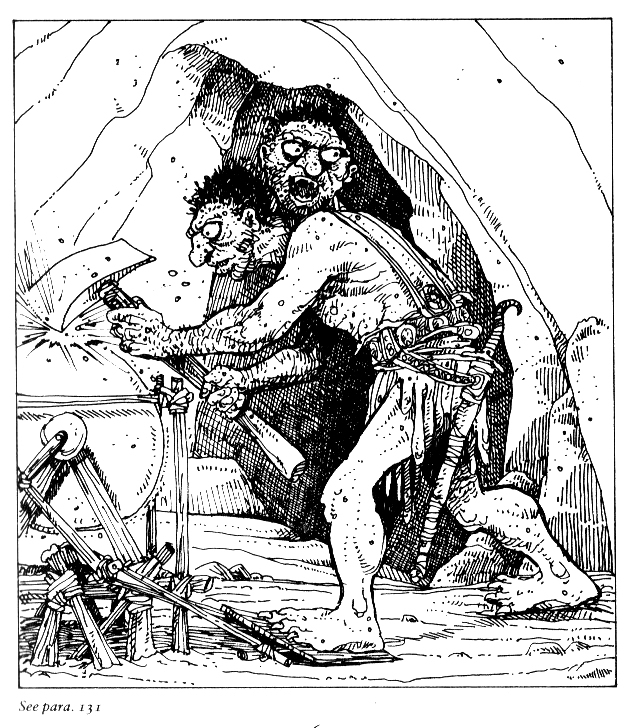 The gremlins, goblins and orcs always have a sinister cruel aspect - the teeth and curved knives feel sharp. 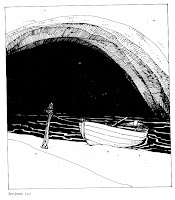 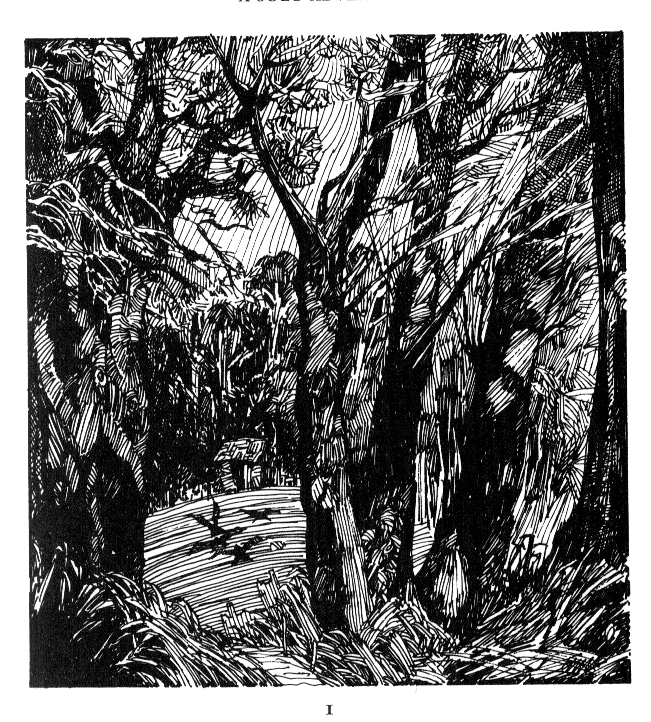 Russ Nicholson is still a very active artist - his blog can be found here.